If August is your birth month, then our August Birthstone Olivine Charm is your perfect crystal charms. The sterling silver bead is refined . August Birthstone Olivine Charm gives off a confidence because anyone wearing it dares to be noticed. 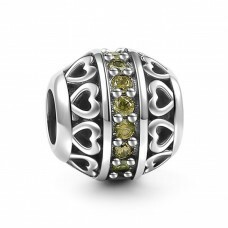 August Birthstone Olivine Charm jewelry shines and draws the eye to your perfect beads bracelet. Wear it with other 925 sterling silver charms for an eye-catching style.